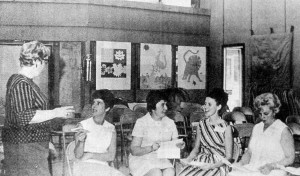 Before the mid-1960s, care, education and basic human rights for people with disabilities were limited to individual communities having the passion and drive to create better opportunities. More often than not, parents were encouraged to institutionalize children with any disability, and for disabled people, spending their whole lives in asylums and institutions was the norm. Parents that chose to keep their families intact faced incredible challenges, as information and services were extremely difficult to acquire when they existed at all. Parents that kept their families intact faced incredible challenges as information and services were extremely difficult to acquire. 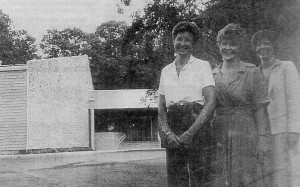 In November of 1959, the Beaverton Kiwanis Club donated the land and construction for the facility previously known as The Arc of Washington County, today known as Imagine Possibilities. With only one paid staff member available, parents and community members volunteered at the school to teach classes, dig ditches, make repairs, and create a community where families could come together for support, education, and celebration around their children. The founding families were instrumental in many firsts within the community for children and adults with disabilities. They organized to bring the Special Olympics to Washington County with retired Blazers as coaches. They were key players in changing laws, pressuring the school system for better educational opportunities, creating training programs, and establishing group homes. Many of the people that drove advancements in the early years are still, to this day, working hard to ensure progress doesn´t stop within the disability world. This history is one we are proud to continue. Imagine Possibilities is committed to celebrating the progressive spirit of the founders, working to strengthen the beautiful and safe community we make up and to ensure it is connected deeply to all of Washington County. On October 1, 2012, Imagine Possibilities disaffiliated from the national Arc organization, which we had been a part of since 1959. When we were founded, operating as one part of a larger organization gave us a greater sense of legitimacy and a network of like-minded groups to align ourselves with. However, eventually we felt that our mission of direct support had diverged from the national Arc’s focus as an advocacy organization, and decided we wanted a name of our own to distinguish ourselves and our specific goals. We chose the name Imagine Possibilities to remind ourselves of our mission: to imagine a lifetime of possibilities for people of all abilities, to appreciate what every person in our program and our community can bring to the table, and to enrich the lives of the people we serve by giving them opportunities they wouldn’t otherwise have.